As reported by The Herald, the project is being led by Sydney University School of Aerospace, Mechanical and Mechatronic Engineering PhD candidate Zi Wang. 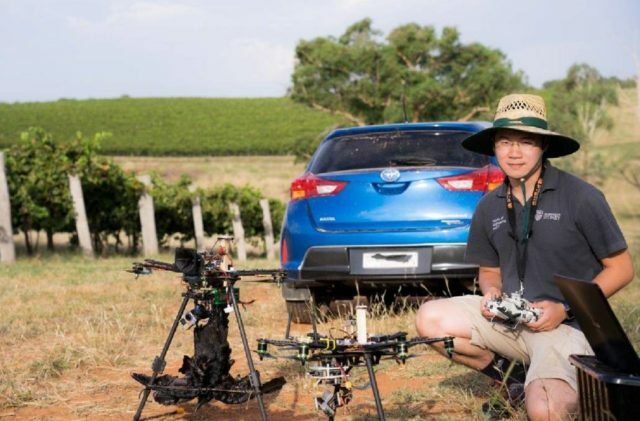 Wang, 26, is trialling the drone, or unmanned aerial vehicle (UAV), in vineyards in the Hunter Valley, Hilltops and Orange in New South Wales. The UAV mimics bird behaviour, emitting fake distress calls as it flies over the vines. In order for the birds to see the drone, Wang has attached a dummy crow to the undercarriage. The operating system for the drone uses GPS and is equipped with an antenna and long-range telemetry radio. The aim is for the system to detect the presence of birds, and automatically launch in response, scaring the birds away from the grapes. Results from the trials will be compared to other more conventional bird deterrents such as netting and auditory bird scarers. This is not the first time that a drone has been used to scare away pests from vineyards. In 2014, a US company has developed a similar drone that was also capable of collecting vital environmental data for winemakers. Tech company Precision Hawk designed its drones to resemble a hawk. The Lancaster Mark III, released in 2014, weighs only 1.3kg and is capable of collecting data on crop protection and crop production. Drones have also been used by drinks companies and establishments to perform different tasks, such as a hotel which delivers Champagne to its penthouse guests by drone, and a bar in Minnesota which has been known to deliver cold beers by drone to fisherman out on the state’s frozen lakes. Robots are also being used by the industry, with Symington Family Estates trialling robotic vineyard helpers back in 2017. Called VineScout, the bot is designed to be autonomous and capable of monitoring temperature and taking other readings to help viticulturists and winemakers with vineyard management. The robot will help areas where de-population of the countryside – with younger people moving en masse to the cities, a real problem in Spain and Portugal – is making labour harder and more expensive to find. Symington are part of the five-member pan-European consortium that is developing the robot over a three-year period. The consortium hopes to have the VineScout ready for series production from 2019/20.